The GEM Project aimed at promoting learning about intercultural dialogue through playing. 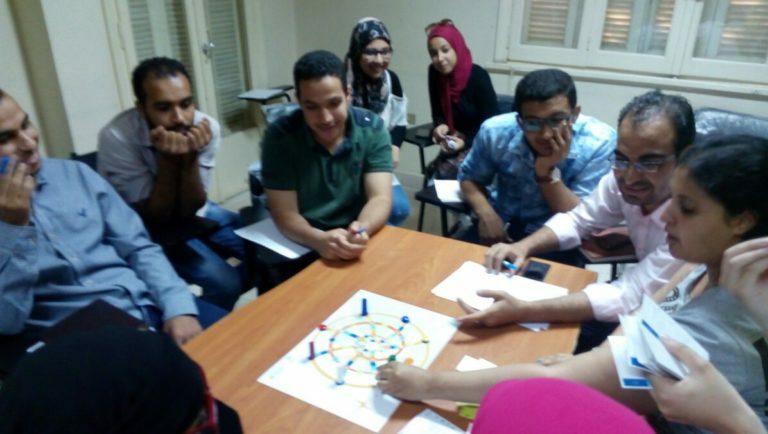 The project went through 4 phases: the first phase was an online training in Gamification and intercultural citizenship. The second phase was the development of the game and translation into 4 languages. The third phase was the pilot workshops in schools and youth centres. The fourth phase was the dissemination seminar internationally in Palermo, Italy and locally in Egypt. 4 organizations from 4 countries have participated in the GEM project; “CESIE” from Italy, “ADICE” from France, “WASEELA” and Think tank from Egypt and “JOHOUD” from Palestine. Y-PEER Egypt which is working with youth peer education network of organizations and institutions has been pioneered by UNFPA in 2002. “Fadilia” Foundation is a social enterprise, which is working in community development field for the sake of building the virtuous city community (Utopia community) in slums through launching social entrepreneurship in slums differentiated by sustainable development. “Egyptian association for development” which is an NGO working in the development field and has an interest in education. Partnership with “Selmya”; as we participated in the International Day of Peace with the Game, more than 20 attendees were watching the 8 players while playing.